Connecting the World: India & Brazil: A Special Bond? India & Brazil: A Special Bond? A recent article in The Globalist (theglobalist.com) examined the similarities between India, which is usually compared to China, with Brazil, a third member of group of countries known as the BRICS. The piece was written by Ruchir Sharma author of the book “Breakout Nations: In Pursuit of the Next Economic Miracles”. He writes of the similarities in the cultures of the two countries where long standing close relationships are a fundamental element of society. Tradition and values are shared within the group and it is likely that members of ones group are given special consideration in all matters, opening up the possibility of favoritism and corruption. One way to discover if his idea can be confirmed is to review the most recent Corruption Perception Index prepared by Transparency International. (transparency.org). Their 2011 report ranked the perceived levels of corruption in over 100 countries. New Zealand was rated the least corrupt with a score of 9.5 (the best possible is 10 with the worst being zero). 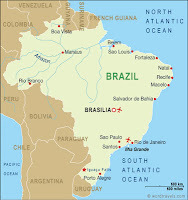 As far as India and Brazil, the results do not reveal the similarity suggested by the author. Brazil ranked #72 with a score of 3.8 while India was #95 at 3.1 (The other BRICS nations, China and South Africa, were #75 at 3.6 and #64 at 4.1 respectively). This report is just one tool that can be used to compare countries of the world. The authors premise that there is a special bond between India and Brazil is worth considering and watching to see what we observe.